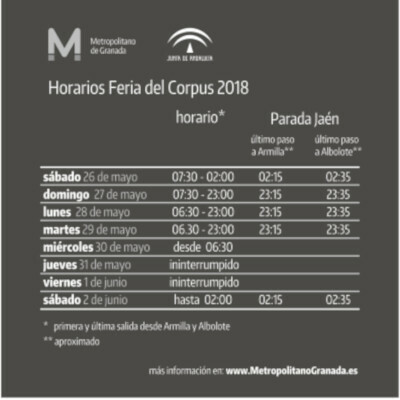 From 26th May and 2nd June 2018 celebrates the Corpus Fair in Granada. Check all info about mobility: Public Transport, parking, affections, etc. 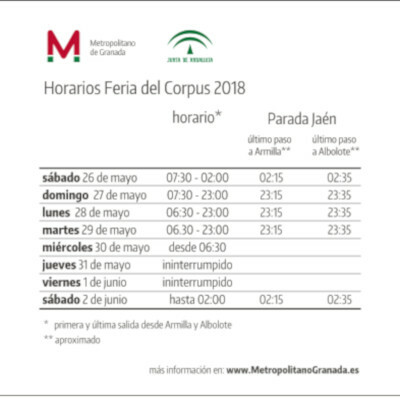 During the period of the Corpus Fair in Granada it is necessary to activate an special mobility plan, traffic, public transport and security to meet the demands of this season. Main mobility affections are located both around the Fairground and the city center of the city as well due to the Tarasca festivity and the Holy Parade of Corpus Christi. All info about the Corpus Fair in Granada can be found at www.granadatur.com and at Programa Oficial in PDF. All info about collective urban public transport at Transportes Rober. Light Rail in Granada will work continously from Wednesday 30st May, from 6:30 in the morning, until 02:00 hours in the morning of Saturday 2nd June to 3rd June, when the Corpus Fair ends, a continous service for the first time and that will mean to be operative during 91 hours and a half, giving maximum coverage on the main important days of the Corpus Fair, where is expected a great amount of public. Due to the Corpus Fair 2018, on 30, 31 May and 1 and 2 June (Wednesday, Thursday, Friday and Saturday), bus lines 110. Granada -Peligros- Caserio de Fonseca- Monteluz, and 127: Atarfe -Albolote (shuttle), will have service on Saturday (in its usual night-time slot) to favour transfer with Light Rail in Granada. More info at Consorcio de Transporte Metropolitano del Área de Granada. There have been made a number of departure and exit routes for private vehicles, and ways of accessing the fairground for credited vehicles, taxis or buses as well, to have more fluency on the accesses. 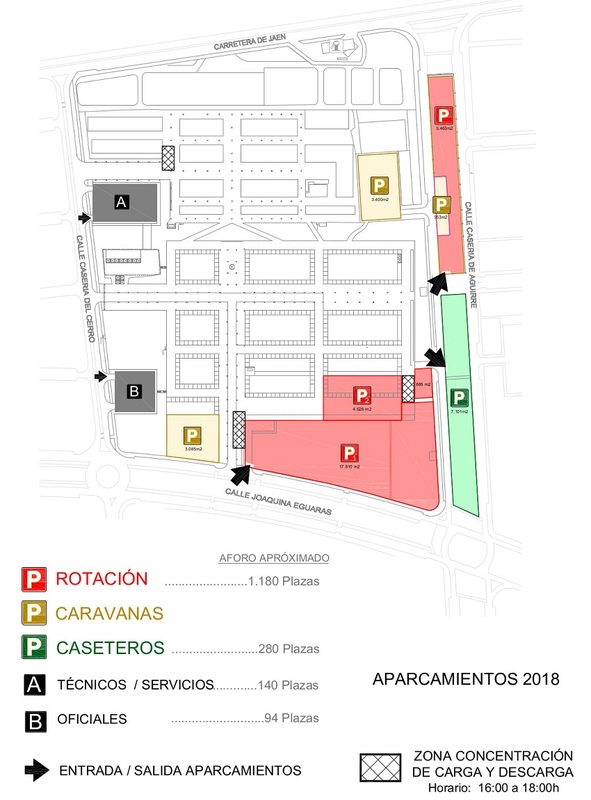 Accesses to the Fairground parking will be from the roundabout under A44 (Almanjáyar-Maracena) - Merced Alta - Joaquina Eguaras, where you will find the entrance to the parking. 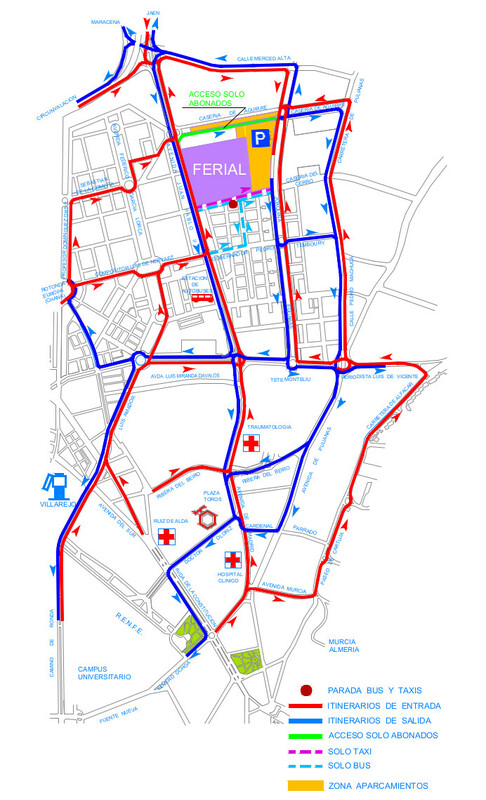 Exit from Fairground will be through Joaquina Eguaras, following through roundabouts of Pedro Temboury or Tete Montoliu. Casería de Aguirre, between Juan Pablo II avenue and Joaquina Eguaras, will be access to just credited. Bus and taxi stop will be in Casería del Cerro, between Juan Pablo II Avenue and Joaquina Eguaras, so this road will be only bus and taxi, next to the access of the stop from Gobernador Pedro Temboury. We recommend to use public transport. When using private vehicle use the highway (A-44), return trip. Please drivers pay attention to Local Police indications, that can be altered or closed in some roads. 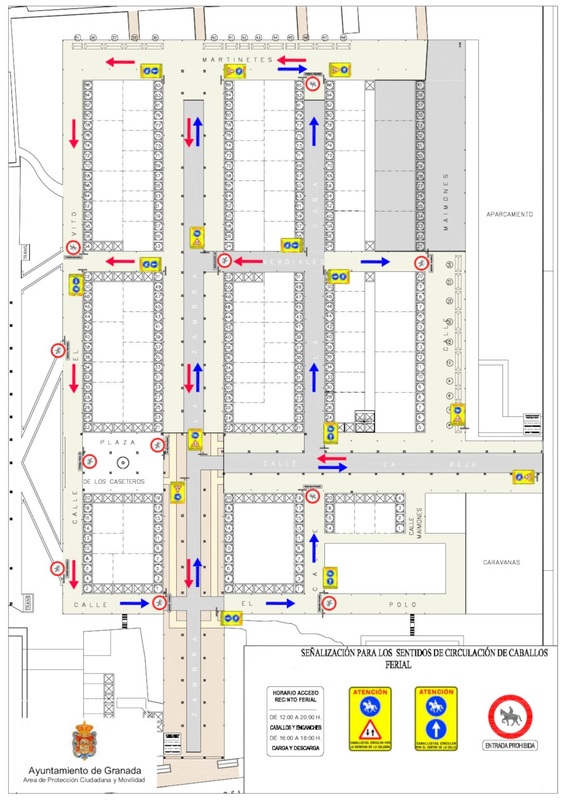 Street Casería del Cerro (where the main entrance of Fairground is) will be one direction only from Juan Pablo II Avenue to Joaquina Eguaras. This road will be only for public transport, disabled people vehicles (P.M.R.) and authorized vehicles; leaving right side lane exclusively for urban collective public transport and the access to the garages of that street, and the left lane will be for taxis, P.M.R. and credited vehicles. Will be completely prohibitted to circulate, park and stop in those mentioned streets, that only can be used for residents with garage in that area. Streets that end in Iznajar street will become dead end streets. Next to Corpus Fairground will be a rotative parking marked in red on the following map. 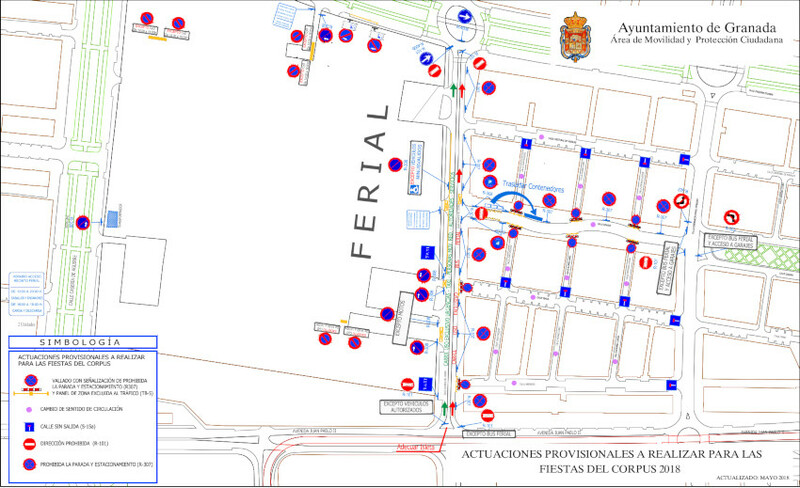 The access to rotative parking will be from Joaquina Eguaras Street. Green area will be reserved for fair workers vehicles, and the yellow area will be reserved for fair workers caravans as well. Fare in parking will be 4.50 euros (IVA incluided). On the Corpus Fair in Granada there are two events that create affections to mobility because of traffic cuts made for its celebration. 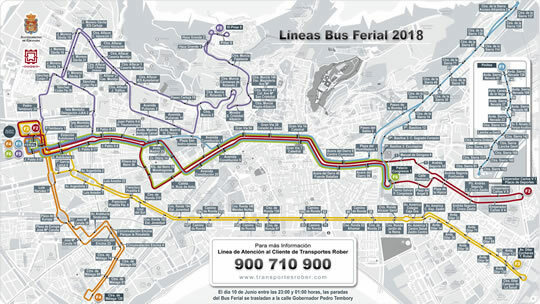 These two events create public transport diversions through Severo Ochoa - Camino de Ronda.